Don't have room at home to make wine? No problem - make it at Curds and Wine! 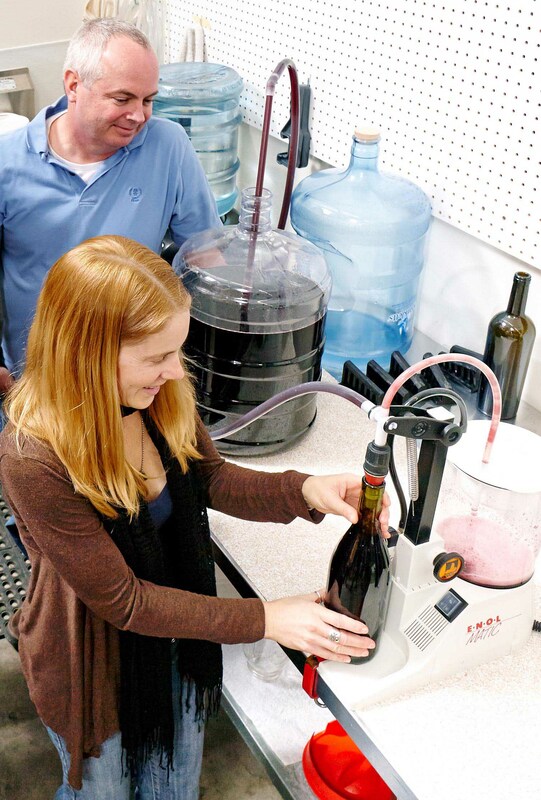 Do all of your winemaking at Curds and Wine, using our equipment -- you don't need to buy anything except your wine kit and bottles! Make your own personalized labels using your own design or our templates, and print them out on our printer - included at no extra charge! You also get a Curds and Wine 6-bottle wine tote to help carry your wine home! Concentrated juice is poured into a bucket, water is added to bring the final volume to 6 gallons total, and yeast is sprinkled on top. This process takes about 20 minutes. 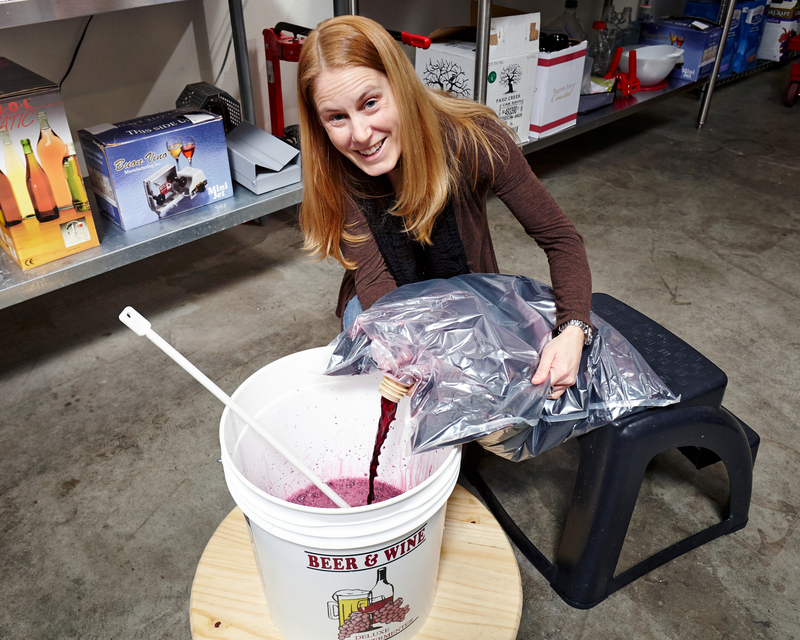 The wine is "racked" or siphoned/transferred to a secondary container. This step also takes about 20-30 minutes. The wine is degassed, stabilized and cleared using a drill-driven wine whip. This step takes 30-40 minutes depending on the kit and how much degassing the particular wine needs. There might be an additional racking step, depending on the kit, or it might be ready for bottling. Bottling takes about an hour. You will need to create a new user name and password -- if you are an existing customer making wine on site with us already please use the email you gave us for your reminders so you can see your own itinerary in the calendar. The calendar will show what times are currently taken. It is easiest to view the time slots in the week or day view as opposed to the month view, which only shows starting times - then you need to click on each appointment to see the full span of the appointment. You can look for openings and let us know what dates and times you would like to schedule; we will enter the final schedule. If you keep the calendar open for a while, please do refresh often so it will update any online changes. When looking for times please allow 1 1/2 hours per appointment, and 1 1/2 hours for each wine you are bottling. Refer to the basic schedule above to estimate time between appointments. Dessert wines (i.e. port style) are a little different, please let us know if you are planning to do a port style and we can give you more guidance. Please do not hesitate to contact us if you have any problems or questions!